Some homeschool critics claim that no useful research results exist about homeschool child abuse rates, that we just do not know what these rates are. The fact that there has been no randomized sampling of the entire population of homeschooled students in the U.S. is customarily used to support that belief. So they rely on pointing to individual cases of abuse to say that homeschoolers have a particularly acute problem with child abuse. But there indeed have been studies which suggest a lower abuse rate among homeschoolers than the national average. This review will examine these studies. The first study was done in 2014 by Homeschool Alumni Reaching Out with data analysis provided by the Coalition for Responsible Home Education. This was based on an online survey of 3,702 graduates of “Christian” home education. 13% of female respondents reported experiencing sexual abuse and 4% of male respondents reported experiencing sexual abuse…. Statistics on the national rate of child sexual abuse vary widely, ranging from 1 in 4 girls and 1 in 6 boys or 1 in 7 girls and 1 in 25 boys, depending on the source for the figures. The numbers in this survey are in line with the lower end of these estimates, and thus may be lower than the national average. The cited statistics, when translated into percentages, ranged from 25% of females and 17% of males at the high end, to 14% of females and 4% of males at the low end. So HARO’s results, on the surface, fit in with the low-end statistics. That is, their results suggest that homeschool sexual abuse rates are equal to, or maybe lower than, the national average. …was first promoted through the homeschool abuse survivor community, from which it spread across the country through online social networks (primarily Facebook). 25% of respondents to the survey ended up coming from these homeschool abuse survivor online support groups. 35% of the abuse reports came from this survivor community (Figure 6). So respondents from the survivor community had a 61.5% higher reported abuse rate than the rest of the sample. What this means is that the sample as a whole is biased to have a higher rate of abuse (of all types) than the general homeschool population. Therefore, we would expect that the actual homeschool sexual abuse rate would be lower than the sample’s, which would push the estimated homeschool rate below the national average. Surveys normally have a seed group of respondents. These initial volunteers are recruited by the researcher, either through existing interest-based groups or through some other more far-flung network of contacts. This starting group likely has characteristics which can be described as “birds of a feather flock together.” Their survey responses will probably be biased, on average, because of their membership in the seed group. The seed group then recruits people they know or have contact with. This “one-hop-away” group can be expected to have characteristics, on average, somewhere between the birds-of-a-feather group and the average characteristics of the total population. The one-hop respondents then recruit second-hop respondents that are, again on average, even more similar to the total population. Eventually we would expect the nth-hop group to have lost all of the bias of the seed group. What this means is that the survey respondents who were not part of the abuse survivor community were still likely, on average, to have experienced child sexual abuse at a higher rate than the general homeschool population. This additional bias in the respondent sample would push the estimated homeschool sexual abuse rate even farther below the national average. So it is reasonable to say that the HARO data suggests homeschoolers have a lower child sexual abuse rate than the national average. Only one question in the survey instrument (questionnaire) dealt with the abuse of minors (i.e., sexual abuse). In a simple statistical analysis, it was revealed that those who had been home educated were significantly less likely to have been sexually abused as minors than were those who were public schooled and those who attended private Christian schools. Further, there was no significant difference in the rate of having been sexually abused as a child between those who were homeschooled and those who attended private secular schools. This is the second body of data suggesting that homeschoolers have a lower child sexual abuse rate than the national average. Homeschooling’s Invisible Children (affiliated with the Coalition for Responsible Home Education) maintains an online database of “homeschool” cases of severe child abuse and child abuse fatalities. Rodger Williams (your author) did an analysis (reviewed by Brian Ray) of this database. Williams found that legal homeschoolers have a child abuse fatality rate 40% lower than the national average. Severe child abuse sits right next to child abuse fatalities on the spectrum defining degree of child abuse. So if homeschool child fatalities are 40% lower than the national average, it would seem likely that homeschool severe child abuse is also lower than the national average. It would be difficult to come up with a reasonable theory to explain how the homeschool child fatality rate could be so low while simultaneously having the homeschool severe child abuse rate equal to or greater than the national average. This body of data suggests that homeschoolers have a lower severe child abuse rate than the national average. Your author knows of no studies that credibly suggest homeschoolers have a higher than average child abuse rate. 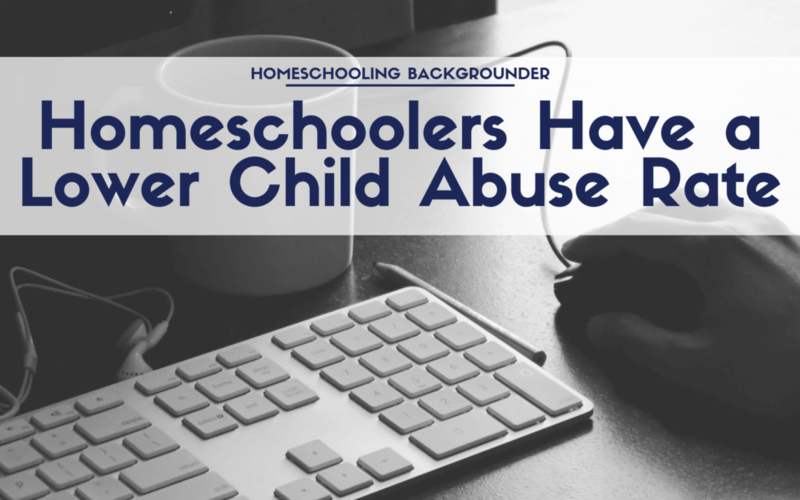 The three studies we have looked at, when taken together, offer credible evidence that homeschoolers have a lower child abuse rate than the national average. We have two bodies of data suggesting a lower child sexual abuse rate and another body of data suggesting a lower severe child abuse rate. There are no studies existing that offer credible evidence homeschoolers have a higher than average child abuse rate.